PNM have developed a wide choice of braking upgrades and modifications to give your Lotus the braking performance it deserves. 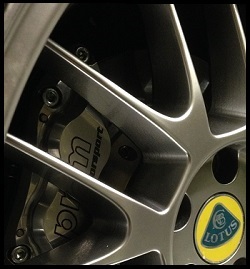 We have designed and developed the biggest range of Lotus brake kits and manufacture many of our brake kits in-house. All kits have been extensively tested. If you are outside of the UK, please check your local rules for fitting aftermarket brake kits as some Countries are very strict about changing from manufacturers original equipment. Enhancing your brakes improves performance, higher-quality brake parts can last longer, decrease stopping distance, perform better under extreme conditions (both on road and track) and as a result improve your vehicle's safety. Of course, nothing says performance more subtly than a set of big, vented rotors peeking out from behind those alloy wheels. Replacement Discs for all kits supplied by PNM are available in either plain, drilled or grooved patterns in most cases. We offer a large selection of braided brake hoses for your Lotus. Typical OEM brakes are designed for cars with standard engines, performing routine tasks, from the morning commute to doing the shopping. But if you subject your vehicle to stresses beyond the ordinary, then standard braking systems will struggle and your OEM brakes can become overwhelmed. The most common occurrence is called brake fade. Under prolonged use on any given drive, your brakes will become less effective the harder they're stressed. That's because car brakes take the kinetic energy of your car's movement and disperse it as thermal energy (heat) when the calipers clamp down on the brake disc. Beyond a certain temperature and loading amount, the standard brakes lose effectiveness. You may have experienced this if you've ever driven down a steep mountain road. After a while, you almost have to stomp on the pedal to get the car to slow down or stop. If you race, high-performance brakes are a must. Performance brake upgrades are designed to dissipate this heat build-up more efficiently than standard equipment brakes. Braided stainless steel brake lines are also a must. The steel-encased Teflon flexes considerably less than ordinary rubber hoses, making for a firmer pedal feel. Braided stainless steel hoses can fail if they're not replaced regularly and protected from debris. If braided stainless steel is in your future, buy from a reputable supplier, and look for lines that come with a polyurethane jacket to prevent chafing. Two more brake upgrades, cross-drilled rotors and grooved rotors have also become an increasingly popular upgrade. The purpose of both is to increase airflow over and away from the rotor (also known as the brake disc), with the moving air taking heat away with it. Brake pads and calipers are another way to upgrade your braking system and there are plenty of options available. It's easy to overdo it and spend way more money than you'll ever use in performance. Suffice to say, you don't need a full race-spec ensemble, here. So how do you know which performance brake upgrade is for you? As usual, it depends on the application. For normal driving with the occasional spirited driving on challenging back roads, a plain or grooved rotor with performance pads is more than adequate. For a track-driven car or racecar, a more robust package is desirable. But be warned: racing brake pads can "bite" so aggressively that they quickly wear out your rotors in daily driving. As with any modification to your vehicle, we do recommend speaking to an expert (feel free to phone us for advice!) before ordering and fitting any kit. Bigger isn't necessarily better when it comes to all things cars. But when talking about brakes, size generally matters. That's because braking performance depends in large part upon how much surface area the brake pads have to bite into. Larger pads and larger brake discs make for shorter stopping distances. In addition, the increased surface area allows for greater heat dispersal. Excessive heat is the enemy of stopping efficiency. Before investing in a big brake upgrade kit or individual big brake parts, there's one thing you should check. You must be certain that your current wheel size is compatible with the kit. Factory wheels often don't provide the clearance necessary for big brake upgrades. The wheel size refers to the diameter of the rim only, not the diameter of the rim and tyre combined. You'll also want to be sure about other issues with each big brake part: Are the rotor and caliper compatible with anti-lock braking systems (if your car is so equipped)? Is there enough room between the caliper and the backside of the rim? If not, can you use spacers? "Can I do this myself?" The short answer is yes, with the proper tools and safety equipment. Be forewarned that dust from older brakes may contain asbestos, a highly toxic substance that is inhaled easily. Also, brake fluid is highly caustic to paint, so if you do it yourself, make sure to keep the brake fluid away from the painted surfaces on your vehicle.